NUBA MOUNTAINS, Sudan (CNS) — While tense relations between religious groups contribute to violence in many parts of the world today, Christians and Muslims in the war-ravaged Nuba Mountains of Sudan say they are getting along just fine. For outsiders, it takes a while to comprehend. “When I first arrived in the Nuba Mountains, I was confused. Everyone dressed the same. Women would wear head coverings, but then I saw them in church receiving the sacraments,” said Comboni Sister Angelina Nyakuru, who serves as head nurse at the Catholic Church-sponsored Mother of Mercy Hospital in Gidel. Sister Nyakuru, who has been in the Nuba Mountains since 2008, compares the situation to her country of Uganda. “Back home, people kill each other over religion, and people who convert have to run away for their lives. Here, families are all mixed, and no one has any problems,” she said. Brother Isaac Kornyando was born in the Nuba Mountains and, for more than two decades, has served as an Apostle of Jesus brother, doing pastoral work in Kauda. Toma Konyono is a reporter for Voice of Peace, the Catholic radio station in Gidel. She and her husband are Christians, but she said all of her in-laws are Muslims. Konyono said the station’s programming is not directed at just Catholics. “When we discuss health or women’s concerns, those aren’t Christian topics or Muslim topics. They are topics that affect everyone in the Nuba Mountains, and we want the station to be a place where everyone has a voice and to which everyone listens,” she said. Dr. Tom Catena, a U.S. physician at the hospital in Gidel, told Catholic News Service that interfaith tensions are few. “Once in a while, some parents will resist their child marrying someone from another religion, but there’s no harshness about it. There’s no harshness toward each other, no negativity, and you simply don’t hear Christians or Muslims talking bad about each other,” said Catena, a lay missionary for the U.S.-based Catholic Medical Mission Board. People of the Nuba Mountains have been at war with the central government in Khartoum for decades. The conflict has been marked by frequent bombing of civilian targets by Sudan’s military. While a 2-year-old cease-fire has stopped the aerial bombing, sporadic fighting on the ground continues between the Sudanese Armed Forces and the Sudan People’s Liberation Army-North. 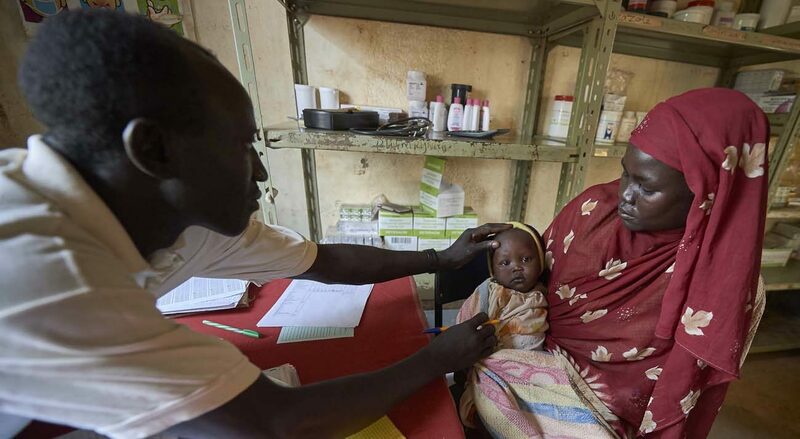 Ugandan Comboni Sister Pollicarp Amiyo, a nurse in Gidel, said years of brutal attacks by the Khartoum government have strengthened a common identity as Nuba people that’s more important than religious differences. “When the planes come overhead and begin to bomb us, everyone suffers. The bombs don’t distinguish between Christians and Muslims. That unites us even more,” she said. A leader of the mosque in Kauda agrees. “We are one family in the Nuba. The land belongs to God, and people practice the religion they want without problems,” said Issa Abrahim al-Madiza. “What is a problem for us is that a group of people in Khartoum sees us as insects, not as people. That’s why they send the Antonovs to bomb us,” he said, referring to the Russian-made cargo planes used as bombers by the Sudanese government. According to John Ashworth, a former Mill Hill missionary priest who serves as an adviser to the Catholic bishops in Sudan and South Sudan, the healthy interfaith atmosphere in the Nuba Mountains helps explain the brutality of the Khartoum government’s military response. “That they get along so well is one of the reasons why they’re seen as a threat by Khartoum. If there were only Christians in the Nuba Mountains, they would be perceived as less of a threat. But the fact that Muslims and Christians live together happily is just too much for the rulers in Khartoum,” he said. Retired Bishop Macram Max Gassis, the former bishop of El Obeid who, for years, has supervised from Kenya the church’s work in the Nuba Mountains, said religious identity has nothing to do with deciding where to provide education or health care or fresh water.